Playing Bid Whist Online is obvious for many users, but sometimes we all want a little extra help. We assume you have already created an account, and downloaded and installed JavaWebStart. 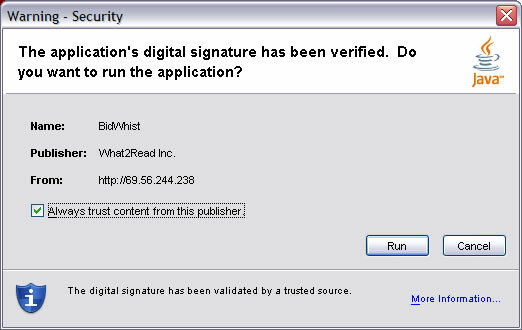 If you have missed one of these steps, please go back to our homepage, www.bidwhist.com. Now you are ready to start playing. Starting game For the first time you play, you must go to www.bidwhist.com. Click on Step 3. The first time you do this you will be invited to added a link onto your desktop to start the game in the future. First you will see a screen letting you know that you have started Bid Whist Online. If this is your first time playing, you will need to wait a minute as the files for the game are downloaded to your machine. When we make changes to the game they are automatically downloaded onto your machine at this time. This is the java security warning. Because we request information from your computer system (e.g., screen resolution, operating system) this warning is presented. If you leave the box checked then you will only encounter this the first time. 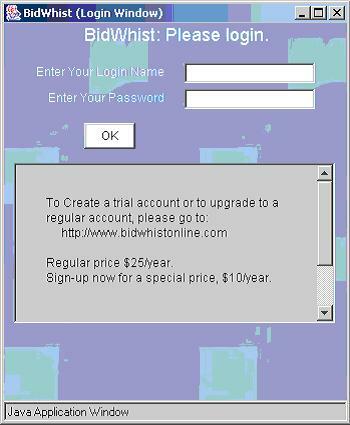 After that first instance, you will immediately get the regular login window. Enter your Login Name and your password. Please remember that your login name and password are case sensitive, so entering "NewUser" is not the same as "newuser". You are now in the exciting world of Bid Whist Online.